Europe is discussing how to improve the labor market performance of economic migrants and their integration chances. The Canadian immigration system is often seen as a model case. Is there an earnings benefit depending on the selection channel under the economic classe? In a new Discussion Paper of the Global Labor Organization (GLO), Casey Warman, Matthew D. Webb and Christopher Worswick provide strong empirical evidence that selection matters. Using Canadian data sources they find that relative to the Family Class, the Adult Arrivals in the Skilled Worker category have earnings that are 29% higher for men and 38% higher for women. Child Arrival immigrants landing in the Skilled Worker Class have similar earnings advantages. GLO Fellow Casey Warman is associated with the Department of Economics, Dalhousie University and NBER. 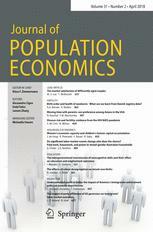 The paper is forthcoming in the Journal of Population Economics. The responsible Editor has been Klaus F. Zimmermann.